Vending machines didn't always just sling soda and smokes. Did you know the automated peddlers have been around for about two thousand years? In fact, the very first vending machine was invented by first-century mathematician Hero of Alexandria to dispense holy water using a series of valves, pulleys, and weights. And they've been stuffed with just about anything you can imagine since. It wasn't until after the Industrial Revolution that vending machines became a normal sight. The first ones, which sold postcards, appeared in London in the 1880s. Then in 1888, they traveled across the Atlantic to New York City, where machines built by Thomas Adams Gum Company peddled chewing gum on subway platforms. We've been buying all kinds of things from machines ever since, from whiskey to hot meals to fruits, and all kinds of foods and oddities in between. Here are some of our favorites. 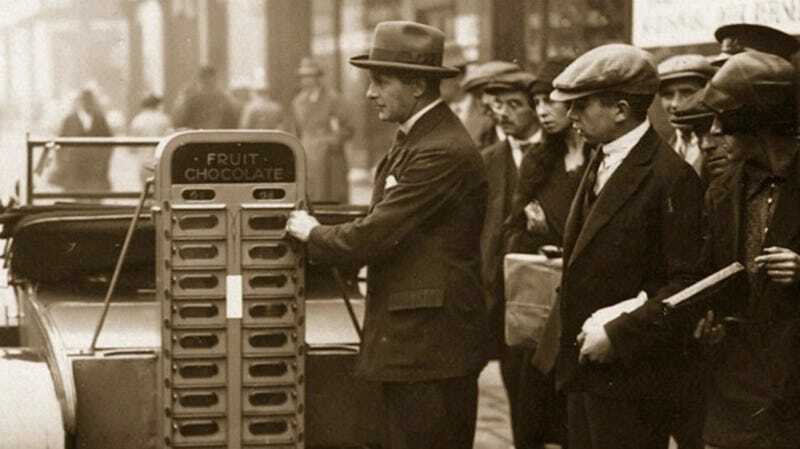 In 1918, when vending machines were still a recent phenomenon, they dispensed pies. Today's vending machines should take a hint. In that same year, vending machines would give you a manicure. This 1953 machine was ancestor to the modern Great Wall Super Buffet. In 2013, you can't really imagine a hot meal from a vending machine tasting like anything but warm cardboard, but in 1953? Probably still cardboard, according to this hot meal patron's expression. It's safe to assume that the reason we don't see farm fresh eggs straight from the vending machine is that eggs crack. The Book-o-Matic is just as good an idea now as it was when it existed in 1949. Vendo was the company that made all the vending machines, so naturally its lunchroom was stocked with vending machines that sold anything you could want to eat. Some machines were healthier than others, like the 1950 apple shilling Fruit-o-Matic. Flying in 1955 was much riskier and less commonplace. So vending machines for flight insurance were a fine way to capitalize on that.